The Estate Management Business Development (EMBD) Co. Ltd. wishes to congratulate the “Same Khaki Pants” winners of the Aranquez Sports Club, “Day and Night Super Sixes Windball Tournament”. 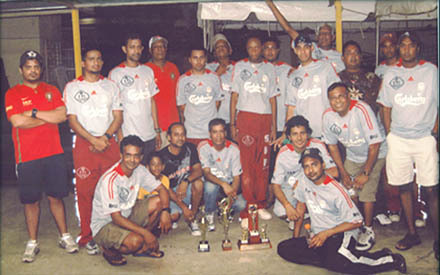 This tournament, which is now in its eight (8th) year was held from the 24th-28th September 2009. Twenty teams from the San Juan and Aranquez areas participated in the tournament. As a main sponsor of the event this year, the EMBD extends congratulations to the Aranquez Sports Club for organizing and managing the tournament, which provides the residents with an avenue to showcase their sporting talent, while fostering a sense of community spirit. This entry was posted on Sunday, November 1st, 2009 at 4:59 pm and is filed under Community News. You can follow any responses to this entry through the RSS 2.0 feed. You can leave a response, or trackback from your own site.